Education Technology and Interactive Media Office (ETO) partners with faculty and staff to explore educational technologies to meet enhance the effectiveness of their courses, and to enable them to adopt appropriate technology in teaching and learning. Through pilots, faculty experiment with technology addressing specific needs. Faculty and staff can explore new and innovative use of technology through the Teaching with Technology Grant. Teaching with Technology Innovation Grants are open for project proposal submission annual. Read more below to find out about some of our past pilots and grants. If you are interested in piloting a new technology in your classroom, contact ETO. Faculty and staff received recognition for their work with technology in a variety of ways. Please view some of the outstanding awards our faculty and staff have received. At the Massachusetts Colleges Online (MCO) annual convention, the state’s fifteen community colleges and nine state universities recognize their faculty for designing online and blended learning Courses of Distinction (COD award purpose and description). Below is a list of Framingham State faculty members who have received COD awards over the past decade. Members of the Mobile Task Force along with professor Aline Davis were recognized with their work with Mobile technologies in 2011. The award celebrated the groups’ study of the impact of Blackboard Mobile Learn and e-texts on achievement and attitudes in a wide-spread initiative that includes surveys, focus groups, and student blogging. Teaching with Technology Innovations grants have been awarded to Framingham State faculty since 2011. Read their project summaries below to learn more. “This program will be used to provide assistance for teachers from the areas served by the [university] in developing their computing proficiency for use in the classroom, for designing new instructional techniques and programs, for improving teaching effectiveness, and for increasing student learning. This program will also be used to provide assistance to [university] faculty, staff, and selected students in developing computing proficiency for improving teaching and student learning. Grant Awarded 2014 to 2015 (Pre-Service Teacher Prep with Mobile Technology and Assessment tools) Using iPad Minis, Education professors continue integration of research based-pedagogical practices, with technology skills and content knowledge in planning. Preparing teachers to be effective in twenty-first century classrooms with students who are digital natives is a critical component of pre-service teacher education at Framingham State University. The majority of Education majors already possess the technological skills necessary for using current technology, but what is missing is the integration of research based-pedagogical practices, with technology skills and content knowledge in planning. This project is designed to give Early Childhood Education majors the opportunity to practice the integration of these three factors while concurrently impacting the learning of young children in the Child Development Lab on campus. 16 students enrolled in “ARTS 305 Comix and Graphic Novels” will transform work that traditionally goes solely to print, into IBooks using the IPad ap IBooks Author. This will allow a class of primarily Studio Art/Illustration Majors to enter into the quickly emerging market of online publishing. 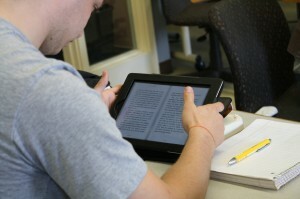 The iBooks program encourages a degree of interactivity with the viewer not possible in printed books. During a typical “Comix/Graphic Novels” course, students produce a short illustrated story with no written words as well as a longer sequentially illustrated story with text and visual “sound effects.” Working with iPads, the students can move beyond the static story and introduce multiple options for reading/viewing. Dr. Aline Davis continues with her investigations for improving student engagement with lecture materials using both in-class polling and lecture capture. The outcome will help to identify a solution that is cost effective, easy to use solution that may be adopted by others at the university. During academic year 2012 to 2013, Dr. Davis investigated the usefulness of the Apple iPad2 compared to Lenovo Thinkpad tablets in an upper division laboratory Biology class. The study examines several technological enhancements in teaching and learning, including: textbook format, audio recording, personal response systems and the mobile Blackboard app. Student participation is on a volunteer basis. The project team was recognized with a Blackboard Catalyst award for Innovation in Mobile Technology at the recent Blackboard World conference in New Orleans. This grant will assist students in the Computer Animation Techniques course learn more effectively by allowing them to embrace new technologies with the iPad and specialized apps as a supplement to the current Adobe software installed on the iMac computers in the Communication Arts labs. The purpose of this undertaking is to teach students a variety of digital animation techniques while facilitating the development of their knowledge of the subject and building their skill base with innovative tools. Grant Awarded 2014 to 2015 (iPads innovation for Food and Nutrition) Instruction in the Nutr479/879 technology course includes computer and tablet functionality that spans 6 major areas of nutrition practice: Business, Clinical, Foodservice, Community, Research, and Education. Educating students for 21st century nutrition careers requires demonstrating knowledge and practice in how to use relevant technology, particularly in light of new HITECH Act statutes. Happtique.com estimates that there are about 40,000 health related apps in the iTunes store. This grant would fund the use of iPads for course teaching, practice, and productivity projects with follow-up assessment of their acceptance by students and faculty, and course design. Grant Awarded 2014 to 2015 (Introduction to Electroacoustic Composition) The funding of this project will essentially start a music technology program that fills in a creative and technological gap currently missing at FSU. This program includes the building and implementation of a digital music studio on campus as a space for a course called Introduction to Electroacoustic Composition. The course will fulfill the Domain I-A General Education requirement. Furthermore, the studio will be available for pre­ approved students and faculty for creative and scholarly purposes. Grant Awarded 2014 to 2015 (Teacher Prep with Mobile Technology) Dr. Milot will continue to pilot the use of iPads in Art Education for students in the FSU Art Education program (the undergraduate Art Education concentration and the Post-Baccalaureate Teacher Licensure program) currently in its first year. In the fall of 2014 the students will work with the newest instructional technology (iPads, apps, on-line resources and education related social media) as they learn to design curriculum, deliver instruction and manage the art classroom. In spring 2015 students will use the iPads with various instructional materials and techniques throughout the semester practicum. This grant will train students in the art education program (undergraduate and Post-Baccalaureate Teacher Licensure students) to use the newest instructional technology (iPads, apps, on-line resources and social media) to design curriculum, deliver instruction and manage the art classroom. Grant Awarded 2014 to 2015 (Online Learning Communities Continuation) This grant will continue work with integrating social media applications in the literature classroom in the proposed course, ENGL 375 Studies in British Literature: Victorian Supernatural. Dr. Lynn Parker will bring together canonical and non-canonical literary texts, as well as historical and cultural materials, encouraging students to trace the significance of this movement as part of a response to rapid shifts in cultural boundaries, including changes in organized religion, scientific theories, and new technologies. Students will use iPads as part of a social media element of the course. Students also participate in an off-campus scavenger hunt for Victorian artifacts and cultural information. Students post images and commentary through Google+. This grant builds upon the experience and materials from a spring 2013 Teaching Technology Grant using iPad mobile technology to incorporate social media tools, such as Google+, annotation software and platforms, such as Classroom Salon, and research tools to enhance the students’ understanding of the literature and culture of the Victorian Period. The use of technology and social media to develop and maintain an online learning community is particularly promising for studying Victorian literature and culture. At a level of information access, researchers on Victorian literature have made marked contributions to opening up electronic access to primary and secondary texts. Brown University’s highly successful “Victorian Web” project provides one such example of the ways in which multiple researchers can gather and open up resources for students and scholars in an online forum. In addition, projects that investigate the implications of new Victorian technologies, such as photography and telegraphy, to transmit and shape information have directed our attention to the ways in which accessing information shapes our understanding of the information itself. Hence developing and sharing resource material has been a priority for scholars of the Victorian period, which provides resources for supporting our own investigations. Grant Awarded 2014 to 2015 (The iOgraphy Documentary Project (iODP)) This grant seeks to improve the learning outcomes for students enrolled in the Communication Arts Department’s Documentary Filmmaking course by providing high quality interactive media tools that will, when used in tandem with new instructional techniques, help build confidence, improve essential skill-sets, and help improve teaching effectiveness in the course. Additionally, if funded, the instructional methodology and problem-solving experiences of students and faculty in this course will be shared through on-campus symposia, regional mass media, various social-media outlets, as well as a presentation at an international conference. This infographic was created to highlight technology and resources used for the 2012 to 2013 grants. On this blogsite, you will find resources, app guides, presentations, a blog feed and more. This website is used to help support our mobile projects, including the grants. The Education Department is collaborating with the Education Technology and Interactive Media Office team to create an interactive timeline of the impact of technology on the educational experience over the past 175 years. Click the arrows below or icons to progress through the timeline. Using the form below, please share your stories and pictures, videos, etc. (if you have them) and be a part of our history timeline. In 2012, Dr. Aline Davis, along with members of the Education Technology and Interactive Media Office, published an article in the Educause Online Review showcasing research results from her iPad study.